Friday’s Washington Post explained what the expiration of a funding boost to the Supplemental Nutrition Assistance Program (SNAP, formerly known as food stamps) will mean for DC-area residents. The American Recovery and Reinvestment Act of 2009 included additional SNAP funding, which expired on November 1. 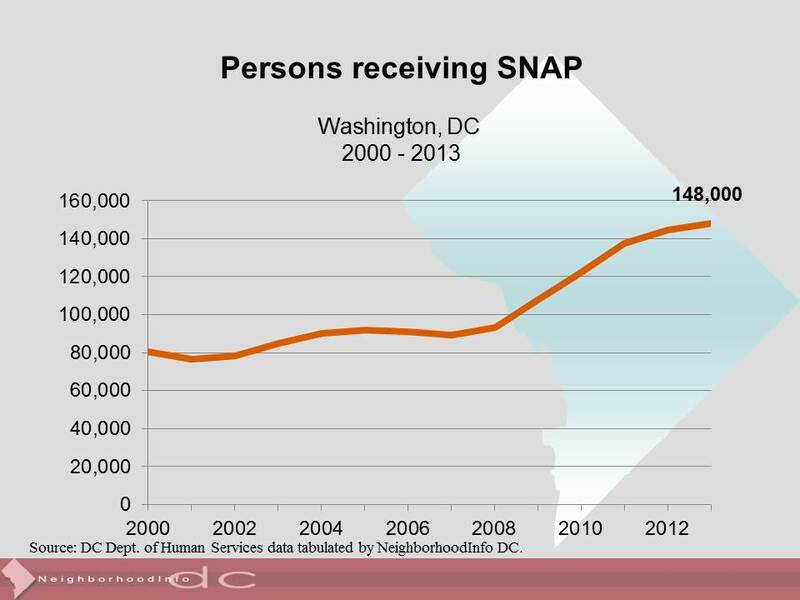 Food stamp dependence levels are high district-wide, but the differences in SNAP usage between DC neighborhoods are dramatic. 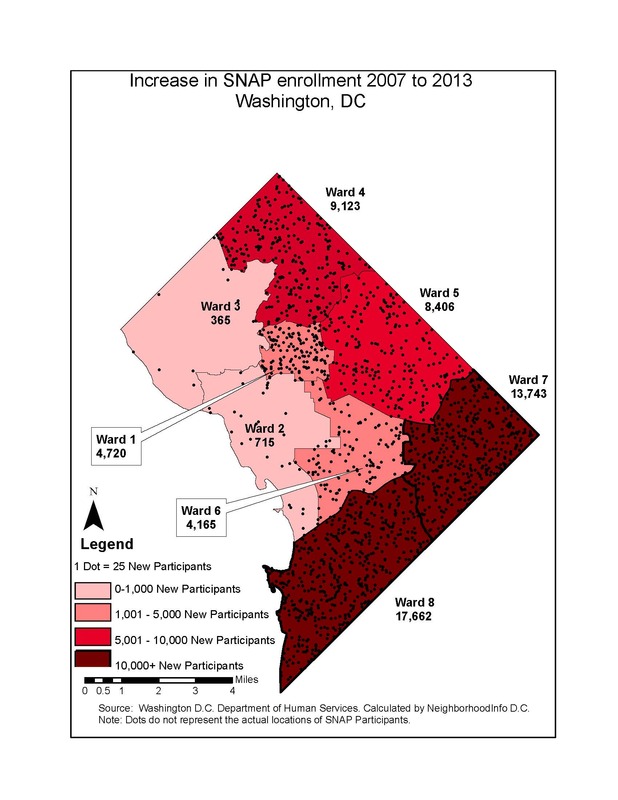 While the total number of program enrollees in Ward 3 rose by only 365 between 2007 and 2013, there were five-digit increases in Wards 7 and 8. Area churches, charities, and other groups that provide food assistance may struggle as they try pick up some of the slack, reported Samuels. But other communities may struggle even more. According to the Food Research and Action Center, nationally, between December 2007 and July 2013, SNAP usage rose nearly 73 percent. The DC numbers presented here and in the Post come from NeighborhoodInfo DC, a website that reports and analyzes community-level social and economic indicators. NeighborhoodInfo DC is the Washington, DC, affiliate of the National Neighborhood Indicators Partnership (NNIP). Founded by the Urban Institute, NNIP now has 38 affiliates around the country. Each one arms residents, municipal agencies, and nonprofit organizations with information they can use to create programs and services tailored to local needs. More and more, we talk about “Data” with a capital D. “Big Data” connotes the seemingly boundless power held by anyone who can pick up the terabyte-sized breadcrumbs that are an unavoidable part of modern communication. But as the Post demonstrated Friday, it is open, free, community-level information, curated by groups like NeighborhoodInfo DC, that can help us appreciate the impact of national policies on cities and towns and accurately describe what’s happening right in front of us.